Pepper was born in Memphis, Tennessee, but grew up in states all over the South and Midwest. He received his Bachelor of Arts from Mississippi State University, his Master of Divinity from Mid-America Baptist Theological Seminary, and his Ph.D. in Speech Communication from Louisiana State University. In addition to his 25 years of pastoral experience in Mississippi, Texas, and Illinois, Pepper has invested a significant portion of his career in higher education. He served as an instructor of Speech and Biblical Studies as well as the Chair of the General Education Department at World Evangelism Bible College in Baton Rouge, Louisiana. 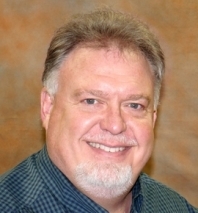 He also served at Howard Payne University in Brownwood, Texas, in a variety of roles, including Professor of Speech Communication, Coordinator of Institutional Effectiveness, and Vice President for Enrollment and Student Affairs. At Greenville College, in Greenville, Illinois, Pepper served as Senior Vice President for Enrollment and then Senior Vice President for External Affairs. Pepper is married to author Deborah Pierson Dill, and they have two children, Ethan and Isabel. In 2010, Pepper came to Bangs to be the pastor of First Baptist Church. But many here remembered him from his time as the interim pastor in the early 1990’s. Pepper and Debby are so happy to have come home to Bangs. It’s an honor and a pleasure to be a part of this church family.